Each face is a different pattern, and some say the symbols spell out words in a dead language. Abesnaki, the Shield-Mask tuxemon, is a Fire-type monster. 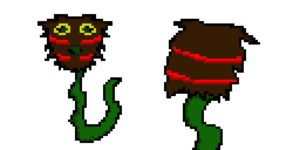 Original design and sprites by mysterynoodler. Face sprites by tamashihoshi. This page was last modified on 21 October 2018, at 00:46.